1. Even in times of a down economy, kid’s tournaments are still something that will get families to travel. We may not be Orlando, Florida, but when we are hosting a tournament of 50 youth soccer teams, that’s thousands of moms, dads and siblings that buy tickets, hotel rooms, meals, fuel and more. 2. 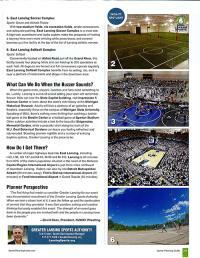 Greater Lansing has great athletic venues! From ice to turf to ball fields and courts we have the surfaces groups need to get their game on. The GLSA works alongside our local venues and potential groups to work out logistics, help provide solutions and guide the entire process along for both sides. 3. The Greater Lansing Sports Authority works to both draw in events to our community that are looking for a host city AND they work with local groups to help grow the events we already hold. That is a non-profit sports focused entity, that is working with tournament events rights holders, local organizing committees, area sports venues and local hotels to put together amazing events that both color people’s lives and inject millions into the local economy. Not all communities have something like the GLSA, and we&apos;re proud to bring our energy, attention and ideas to the sports community of Michigan&apos;s Capital City. 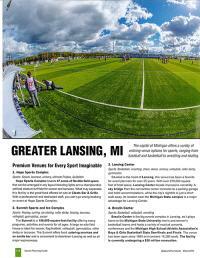 Check out this write-up on the Greater Lansing community and the GLSA in the National Sports Planning Guide and find out for yourself why Greater Lansing is an up-and-coming Midwestern sports city - and why the Greater Lansing Sports Authority is the hardest working sports commission in the business! Interested in finding out more about the GLSA? Browse the other pages of our newly redesigned website. Want more than that? Like to possibly be a part of the team? The GLSA is currently for both event volunteers and GLSA interns to help us make all these great events happen. Are you a hard-working, team-focused, sports-fanatic? We need to talk. You might be just the right person to further our goals for the local sports community!